The creators of St Jerome's – The Hotel will open the doors to their latest venture: Reunion Island Pool Club from midday Friday 25 January. 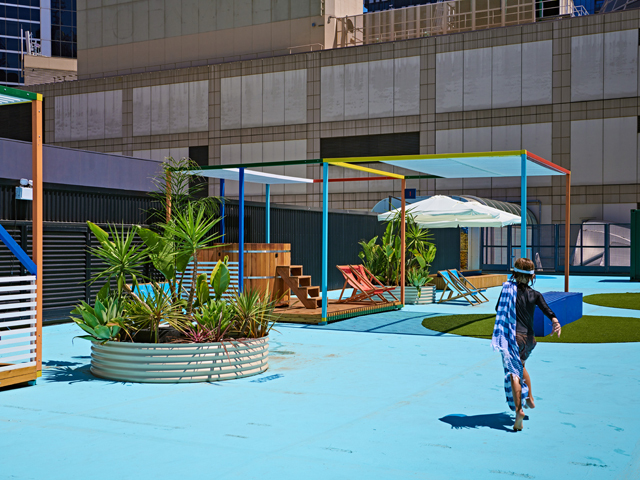 From now until end of May, Melbourne Central's rooftop will play host to the Australian-first rooftop pool, bar and leisure centre. With private pool bookings available for 2 – 12 people, an infrared sauna and bespoke food and beverage pool service, Reunion Island Pool Club is a luxury escape in the heart of the city. Jerome Borazio said the concept is a hybrid of the Aussie public pool and an LA-inspired palm sanctuary. "Our design team has worked hard to deliver a space with a strong aesthetic – cedar wood plunge pools, designated shade and relaxation spaces, bright blue walk ways and palms for days. It's minimal in its design but a bold statement, Borazio said. A pop-up residency from Easey's Burgers will see LA-inspired poolside fare (think burgers, CLUB sandwiches and tacos) served from The Kiosk, accompanied by ice-cold Kirin Beer, Nelson Wines, a gin station from Melbourne Gin Co, Capi Sparkling cocktails and more. The space is set to launch its recreation program in February – with classes from $20 by Here Yoga, KAYA Health, Melbourne Yoga and Pilates and Montana Farrah-Seaton (Tribute Boxing). With all pools fitted with Ultimate Ears sound systems and the General Store kitted out with Quay sunglasses and Reunion Island Pool Club branded towels, visors and stubby holders, every poolside need is covered. And for those looking to cool down without getting in their bathers, Vodka-O have built a custom foot pool where patrons can dip their feet in and sip on a drink. Rideshare partner DiDi will also be on standby, ready to take visitors to and from The Island.